The six-week school summer holidays bring little rest for school premises teams, who use the child-free corridors and classrooms to tackle larger building projects and maintenance tasks. With September looming, our wonderful volunteers have been lending a hand to ensure everything is in place for the new term. Bravo to our latest Community Champions: Broadgate Estates! 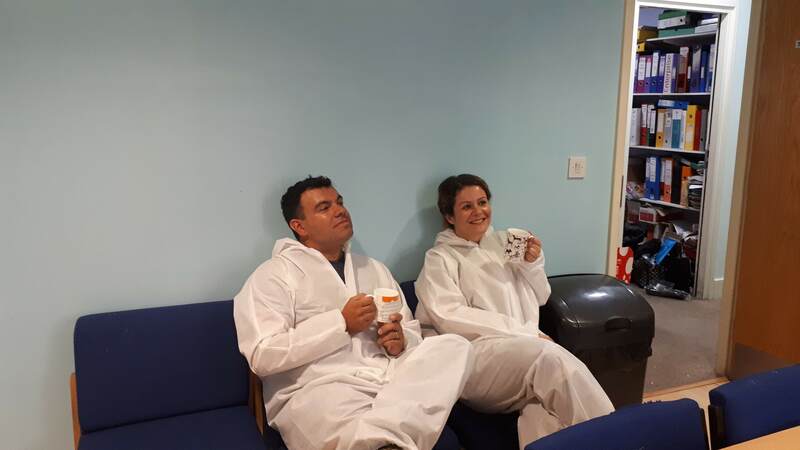 On Thursday 30 August, two colleagues from Broadgate Estates decorated the tired staffroom at Hampden Gurney Primary School, creating an inviting, calm space for teachers to retreat to at lunchtime. Both volunteers have responsibility for managing proprieties at work and applied this keen eye for detail, to do a very thorough job. 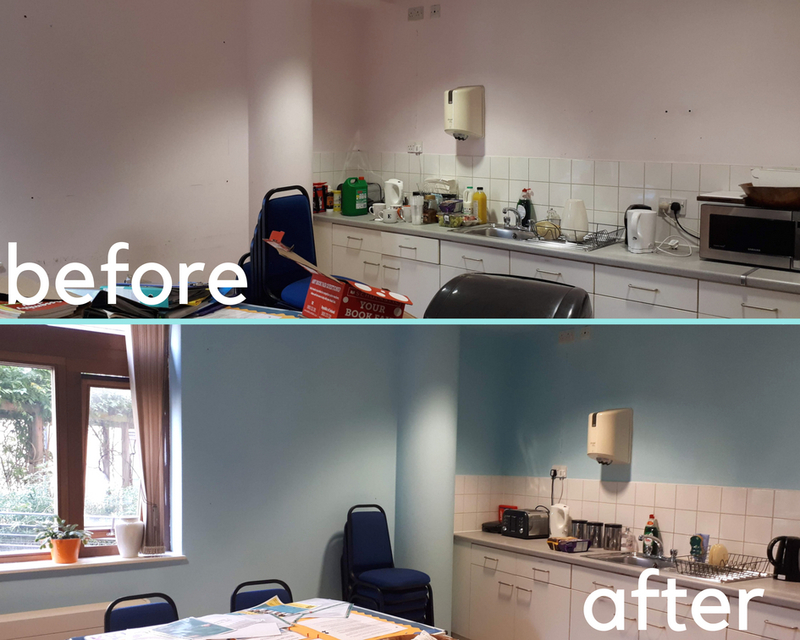 The pair of perfectionists began by preparing the walls; filling in cracks and holes where noticeboards had been removed, removing the remnants of Blu Tac left from notices and clearing the surfaces of an array of kitchen gadgets, including no fewer than three kettles. Having masking taped the skirting boards and window frames, the pair began to paint; completing their first coat before lunchtime. 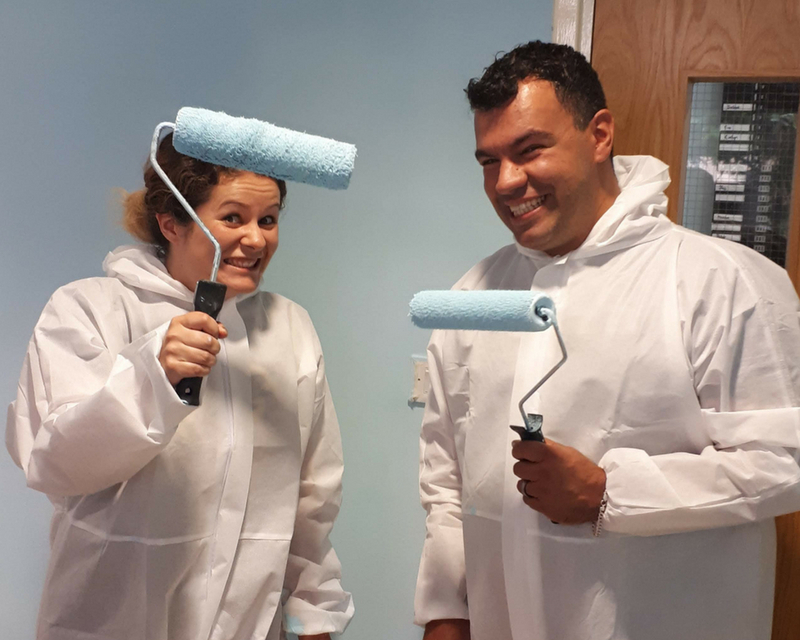 They quickly developed an efficient system – one painting the edges with an array of different sized brushes, whilst the other rolled, all the time singing along to motivational, feel good tunes. Keen to see the job through, whilst the second coat was drying the volunteers cleaned all the surfaces, swept the floor and placed the furniture back in place. By 4pm the room was transformed and this well-deserving duo were able to sit back and admire their handiwork, feeling satisfied at all they had achieved. If you and your colleagues would like to roll up your sleeves, take meaningful time away from your tasks and practically support a local charity or school, please contact our Community Programme Manager, Emily.